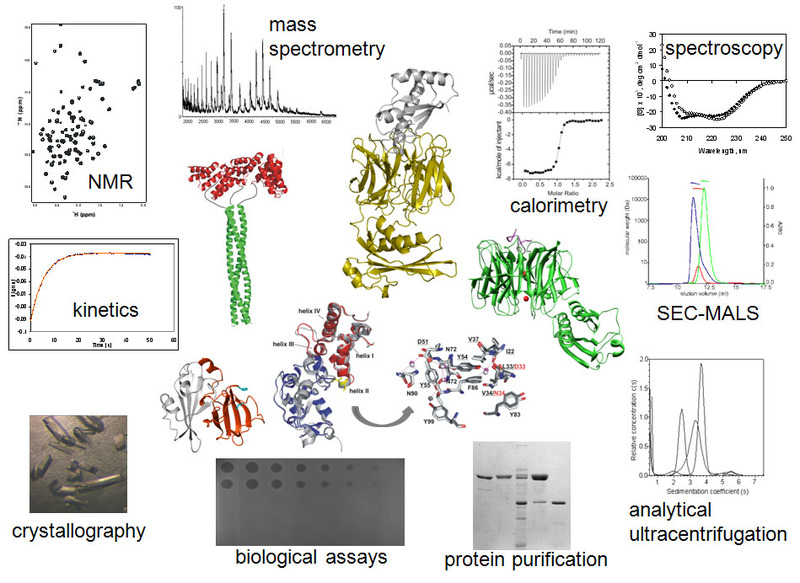 We take a multidisciplinary approach toward the functional, biophysical and structural analysis of protein-protein interactions in a variety of biological settings. The figure shows some of the structures of protein complexes we have solved and highlights the range of methods we use to understand how and why proteins form complexes with each other. Our work is driven by specific biological questions where protein-protein recognition is central to function, and by fundamental questions concerning specificity and affinity of protein-protein interactions. The figure shows structures for the group A colicin ColE3/Im3 bound to its receptor BtuB (solved by the Cramer lab; Kurisu et al (2003) Nat. Struct Biol. 10, 948) and the group B colicin ColIa bound to its receptor Cir, which normally transports iron (solved by the Buchanan lab; Buchanan et al (2007) EMBO J 26, 2594). Both colicins have intrinsically unstructured translocation domains (IUTDs) which recruit translocator proteins and which have embedded within them signalling epitopes that contact periplasmic proteins. We have shown that nuclease colicins such as ColE3 and ColE9 recruit OmpF using the IUTD, with the open lumen of the porin being the likely route to the periplasm. 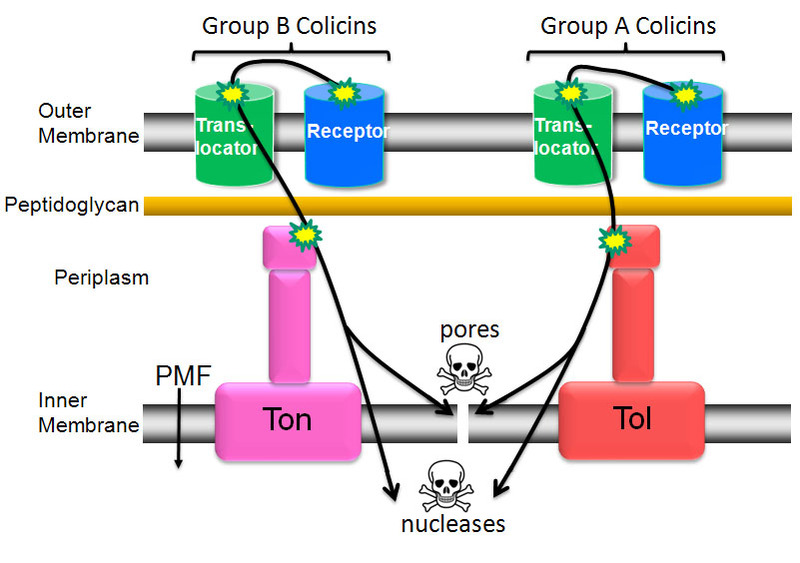 Contact between the colicin’s IUTD and TolB in the periplasm (see slides 4-6) completes formation of a so-called ‘translocon’ formation of which triggers dissociation of the tightly bound immunity protein and initiates cell entry. See Housden et al (2005) PNAS 102, 13849, Vankemmelbeke et al (2009) J. Biol. Chem. 284, 18932 and Kleanthous (2010) Mol. Microbiol 75, 529 for further details. 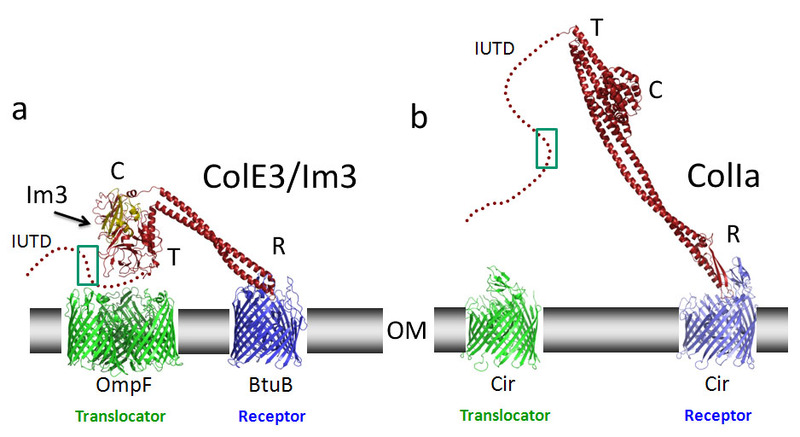 The IUTD of enzymatic colicins such as ColE3 and ColE9 contains a 16-residue TolB binding epitope (TBE) within it which folds into a distorted hairpin and hydrogen bonds to TolB residues in a way that precisely mimics interactions made by helical residues in Pal. See Loftus et al (2006) PNAS 103, 12353 and Bonsor et al (2007) JACS 129, 4800 for further information. 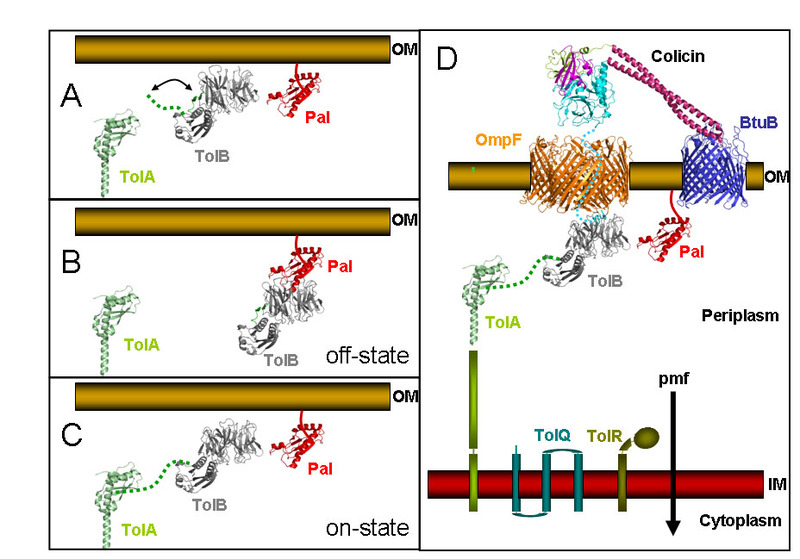 The TolB N-terminus is the docking site for TolA, an inner membrane protein which spans the periplasm and is connected to the pmf via its contacts with TolQ and TolR. In the absence of any binding partners the TolB N-terminus is in conformational exchange. 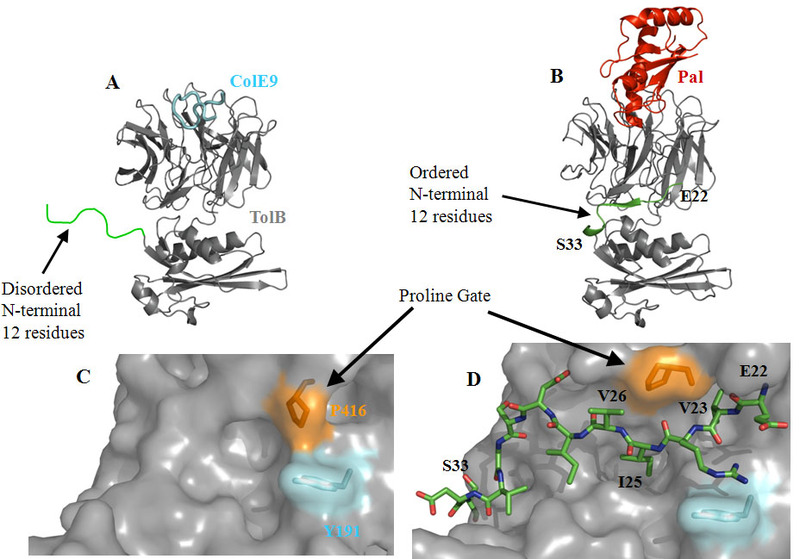 Pal binding to the β-propeller of TolB results in the opening of a proline gate on TolB revealing a binding site for the TolB N-terminus and blocking its ability to bind TolA. Conversely, binding of the colicin TBE to the β -propeller promotes TolA binding by closing the proline gate. Hence, although the colicin mimics Pal it results in a completely different TolB response; this allows the colicin to tap into the pmf-linked Tol system in the inner membrane while still positioned on the outside of the cell. See Bonsor et al (2009) EMBO J. 28, 2846 for further details. DNase colicin cell killing is mediated by electrostatic interactions. 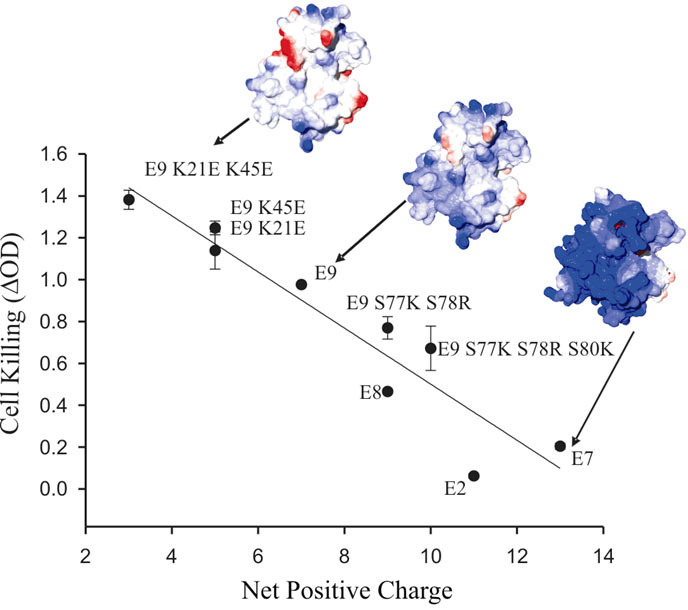 Figure shows the relationship between the degree of positive charge on a colicin DNase (using natural and engineered variants) and the efficiency of colicin-mediated cell killing in liquid culture of E. coli HDL11, a strain which is depleted in anionic phospholipids. 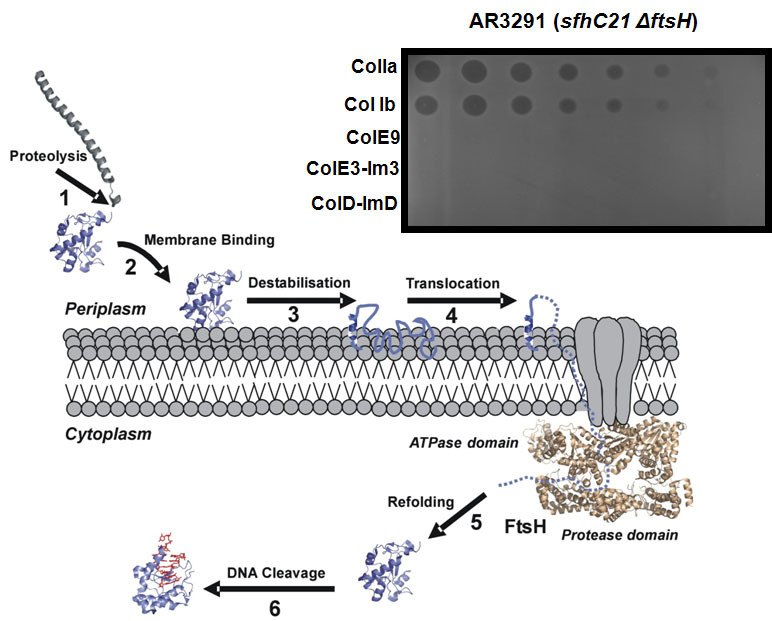 Data suggest a direct electrostatically-mediated interaction between colicin nucleases and the bacterial inner membrane. See Mosbahi et al (2004) J. Biol. Chem. 279, 22145, Mosbahi et al (2006) Protein Sci. 15, 620 and Walker et al (2007) J. Biol. Chem. 282, 31389 for further details. 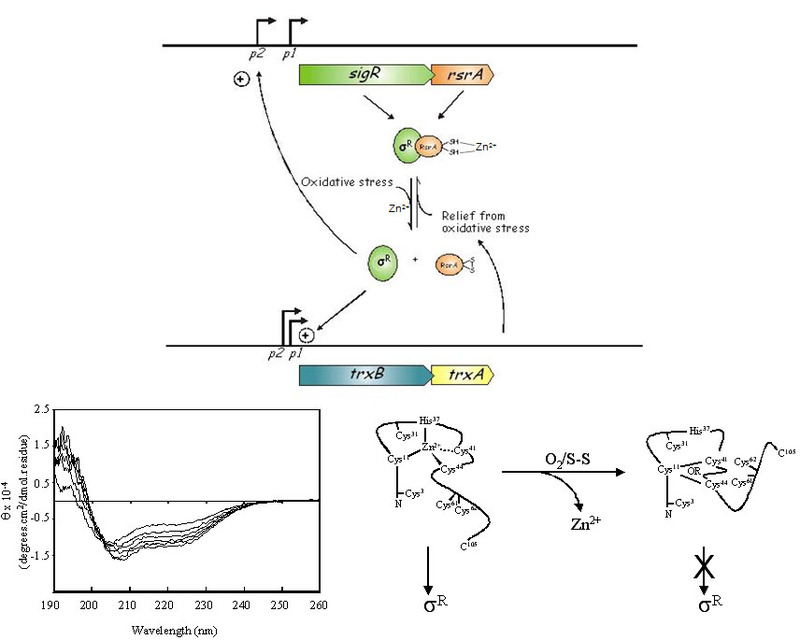 ColE3 kills bacterial cells by blocking protein synthesis which is the result of a single phosphodiester bond being cleaved in the decoding centre of the ribosomal A-site. Cleavage has a profound effect on the translocation step of protein synthesis, resulting in sequential impaired decoding events until eventually translation halts. We have been collaborating with the Rodnina (Witten) and Ramakrishnan (LMB) labs to investigate the mechanistic and structural details of this cytotoxic mechanism. 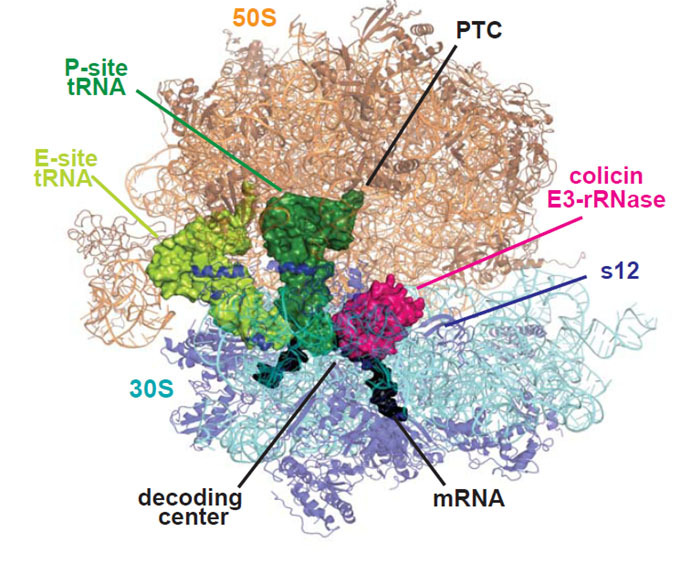 This includes a structure of the E3 rRNase bound to an intact 70S ribosome. See Lancaster et al (2008) Mol. Microbiol. 69, 390 and Ng et al (2010) Nat. Struct. Mol. Biol. In Press for further details. DNase colicins are members of the HNH family of endonucleases, which includes caspase-activated DNases in eukaryotes. Left-hand figure shows the structure of the E9 DNase bound to dsDNA and a single Mg2+ ion. Highlighted in blue is the region of the enzyme that is bound by the high affinity immunity protein Im9, an exosite inhibitor. Immunity proteins protect colicin-producing organisms from suicide and are dissociated from the enzyme during cell entry by an unknown mechanism. Right-hand figure shows ΔΔG data for alanine mutants of the E9 DNase binding Im9 (only 2 helices of Im9 are shown for clarity). The hotspot of E9 DNase meets the hotspot of Im9. See Maté & Kleanthous (2004) J. Biol. Chem. 279, 34763, Li et al (2004) J. Mol. Biol. 337, 743 and Keeble et al (2008) J. Mol. Biol. 379, 745 for further details. 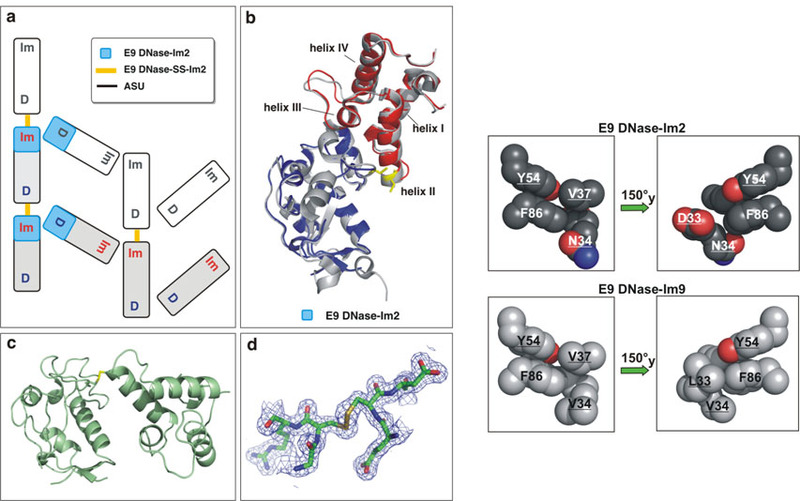 Using NMR-based docking as a guide (collaboration with Geoff Moore in Norwich), we deployed a disulfide-trapping strategy on a non-cognate complex between the colicin E9 endonuclease (E9 DNase) and immunity protein 2 (Im2), which is seven orders of magnitude weaker binding than the cognate femtomolar E9 DNase-Im9 interaction. The 1.77 Å crystal structure of the E9 DNase-Im2 complex reveals an entirely non-covalent interface where the intersubunit disulfide merely supports the crystal lattice. In combination with computational alanine scanning of interfacial residues (undertaken by the Baker lab in Seattle), the structure reveals that the driving force for binding is so strong that severely unfavourable specificity contacts are tolerated at the interface and as a result the complex becomes weakened through ‘frustration’. As well as rationalising past mutational and thermodynamic data, comparing our non-cognate structure with previous cognate complexes highlights the importance of loop regions in developing selectivity and accentuates the multiple roles of buried water molecules that stabilise, ameliorate or aggravate interfacial contacts. See Meenan et al (2010) PNAS 107, 10080 further details. The sigma factor σRand its inhibitor RsrA regulate the expression of ~30 genes in response to disulfide stress in the soil bacterium Streptomyces coelicolor. RsrA is a zinc-containing anti-sigma (ZAS) protein, one of a growing list of transcriptional regulators that respond to diverse environmental cues. During oxidative (disulfide) stress, a trigger disulfide forms in RsrA that causes the expulsion of its single metal ion. 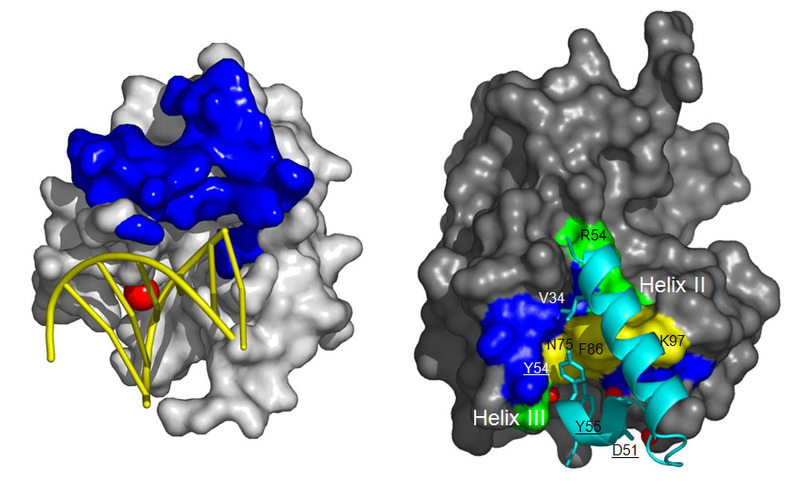 This results in a large structural change that abolishes its ability to bind σR, which is then free to activate transcription of its target genes, including thioredoxin and thioredoxin reductase. Redox homeostasis is resumed when these cellular reductants re-reduce RsrA via the small molecule reducing agent myothiol. 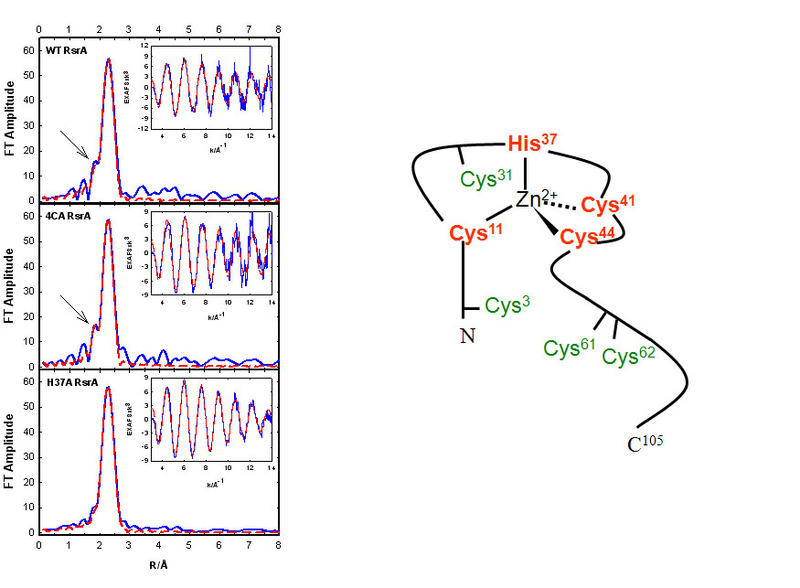 We found that the trigger disulfide is naturally degenerate, formed between all three of the metal ligands, Cys11, Cys41 and Cys44, which causes substantial changes in protein structure, as deduced by circular dichroism spectroscopy. See Kang et al EMBO J. (1999) 18, 4292, Li et al (2002) J. Mol. Biol. 323, 225 and Li et al (2003) J. Mol. Biol. 333, 461 for further details. Controversy surrounded the metal ligation chemistry of the single zinc ion in RsrA. We used a combination of mutagenesis and EXAFS spectroscopy to define this coordination chemistry, which includes the three cysteines known to be involved in forming the degenerate trigger disulfide bond in RsrA. Three of the ligands to the metal ion (His37xxxCys41xxCys44) are part of a sequence motif which is invariant in ZAS proteins. See Zdanowski et al (2006) Biochemistry 45, 8294 for further details. 2012 Organising Committee, Biochemical Society Focus Meeting 'How bugs kills bugs: Progress and challenges in bacteriocin research', University of Nottingham. 2011-2012 Chair, Wellcome Trust Basic Science Interview Committee. Professor C.V. Robinson FRS, Department of Chemistry, University of Oxford. Professor Hagen Bayley FRS, Chemical Biology, Department of Chemistry, University of Oxford. Professor Mark Sansom, Department of Biochemistry, University of Oxford. Professor Jacob Piehler, Division of Biophysics, Universität Osnabrück. All graduate student enquires should be directed to Prof. Colin Kleanthous.